Who wouldnt love receiving this festive, edible gift? For a co-worker, client, vendor or friend, its the deliciously right choice. 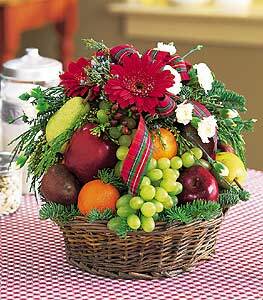 Apples, grapes, pears and tangerines arrive in a wicker basket decorated with carnations, gerberas and evergreens. Note: Same day delivery for this item may not be available in all areas. Thanks, for the good communication and the fast service.